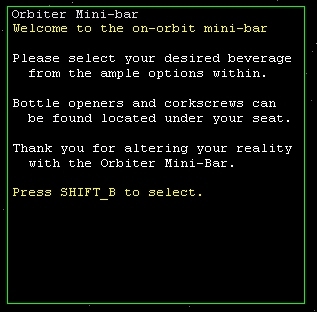 Orbiter Mini-Bar (OMB) is an MFD for simulating some of the aspects of human physiology and its effect on personal space travel. It was one of the first realism enhancements for Orbiter, when released in 2003. All other keys are numeric. It enforces enhanced manual dexterity at low orbits, full simulation of the effects of space flight is only permitted once an altitude of 100km has been achieved, or the pilot has turned off the seatbelt sign. A number of different options can be configured by the user based on statistical estimates of tolerance of the key external factors, and the desired rate of exposure. The ongoing effects of this exposure are modeled, with an enhanced time factor commensurate with the simulated nature of the environment. There have been critisms that the add-on requires an overhead in the form of fuel consumed, but this is seen as a feature of the necessarily non-efficient human input factor associated with extended duration solo spaceflight that necessitates this simulation. This article has a precis and appears in the Random addon or Random article section on the Main Page. The precis can be found at OMB/precis and is displayed below.